MaxLife Fiber Bed Mist Eliminator Compressed Air and Gas Filters, 85-18,267 cfm. The MaxLife Fiber Bed Mist Eliminator combines superior performance in particle elimination with unrivalled service lifetime – guaranteed. Typically placed in service as the main pre-filter to a dryer, MaxLife captures lubricant and condensed moisture carryover, even in the event of a compressor separator collapse. 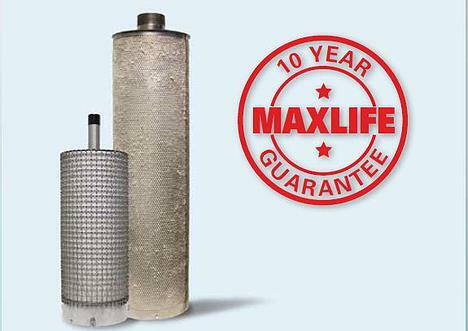 The MaxLife filter makes financial sense too, because it only creates 1/10th of the pressure drop of a regular coalescing filter and has a service life 20-30 times longer than conventional filters. The design and fabrication of the equipment is implemented under a program for quality assurance and quality control. The program conforms to the latest edition of codes, standards, welding processes, inspection and testing. The documents, specifications, drawings, and records maintained are current and under control. 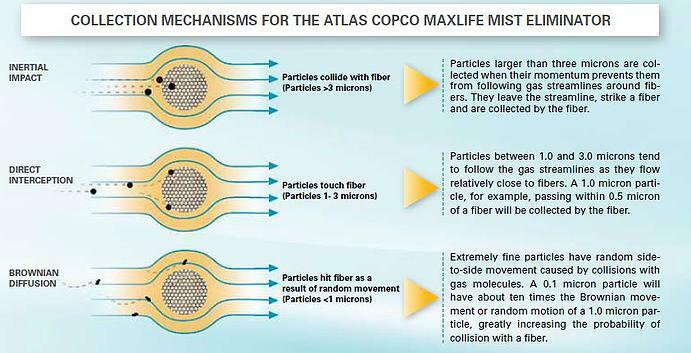 Atlas Copco’s ongoing investment in research and development results in continuous product improvements. Atlas Copco reserves the right to change or revise specifications and product design in connection with any feature of our products. Such changes do not entitle the buyer to corresponding changes, improvements, additions or replacement for equipment previously sold or shipped. MaxLife has an infinite turndown ratio, so peak performance is available even at minimal flows. The efficiency curve actually improves as the flow decreases. This means that MaxLife can be over-sized for future expansion without compromising current performance. In contrast, filters based on pressure differential decline in performance as flow substantially decreases, and it is not advisable to over size this type of coalescing filter.